Rota unavailability is an optional feature that must first be enabled in the Rotas module options. 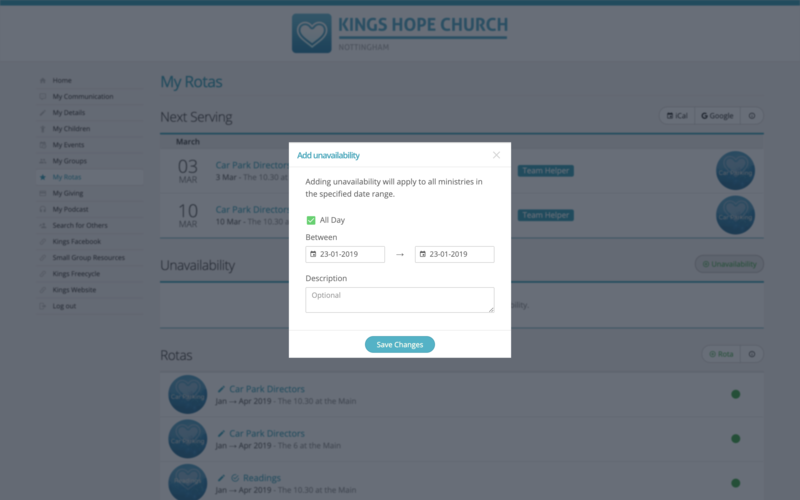 Once enabled, the Unavailability section is added to the Rotas module and ministry overseers and serving team members can easily begin managing their rota unavailability within ChurchSuite and My ChurchSuite. Rota members and overseers can record single dates, or ranges of dates of unavailability, perhaps for holidays. Essentially, unavailability causes a clash notification for ministry overseers when they attempt to add or swap a team member to a rota date when the person is unavailable. Unavailability clashes are reportable in a Clashes report in the Rotas module's reports section, and are displayed on the rota Clashes page on each rota in ChurchSuite and My ChurchSuite. They are also shown visibly against the serving rota member's Next Serving list in the My Rotas section of My ChurchSuite. And finally, unavailability is displayed on a serving rota member's profile page in the Address Book and Children module. 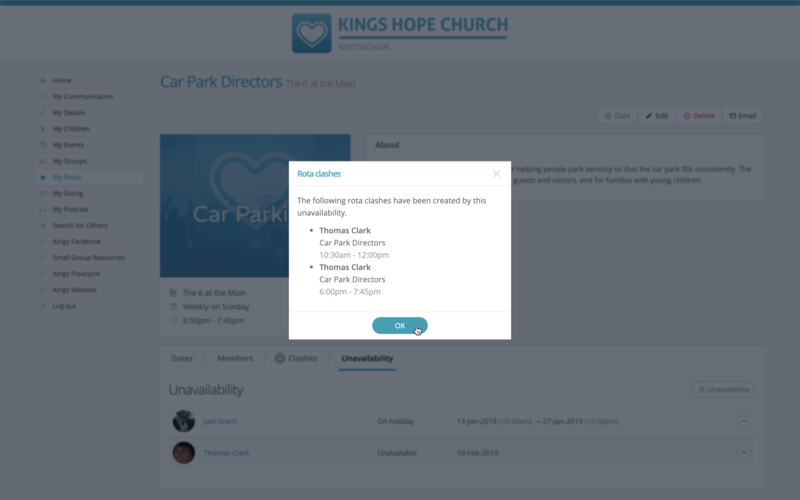 Within MyChurchSuite, rota members are prevented from processing swaps with unavailable rota members, although ministry overseers are always able to override any rota clash notification, including unavailability. Unavailability cannot be edited once added, but it can be deleted if no longer required, and re-entered if the unavailability dates have changed. To delete unavailability, select Unavailability on the grey menu bar and use the cogwheel to the right of the relevant entry to delete it. 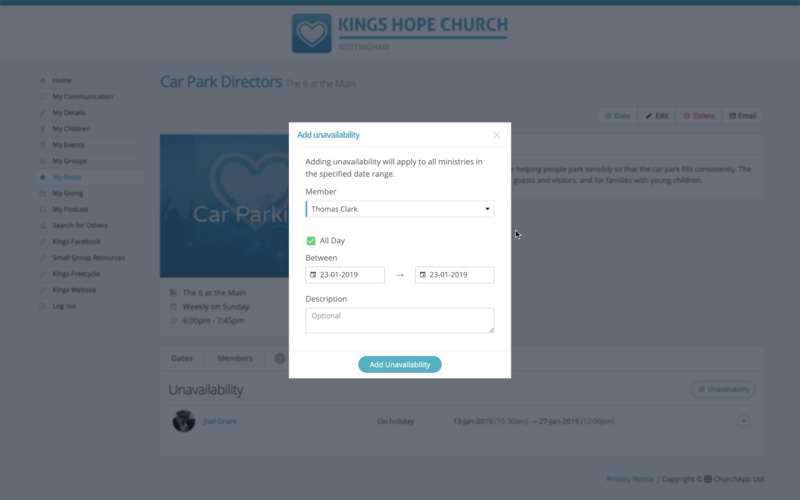 Unavailability history is retained in ChurchSuite and can be viewed in the Rotas module by switching between Past and Future on the Unavailability page. Unavailability moves from Future to Past when the final date in the unavailability range has passed. Duplicated or overlapping unavailability is permitted and handled by the system. Unavailability applies across all ministries - it is not ministry specific. It is therefore not possible to add unavailability for one ministry while remaining available for other ministries. A person flagged unavailable will cause an unavailability clash across all rotas where a rota's date clashes with the unavailability. Where adding unavailability generates a rota clash, an email notification is sent to the ministry overseer(s). Where adding unavailability doesn't generate a clash, no email notification is sent to the ministry overseer, although they will receive a clash notification if they attempt to add an unavailable person to a rota. For overseers, at the point of adding a rota for a ministry, rota members with unavailability will continue to be assigned to their normal rota dates according to their ministry's team rotation; however a visual indicator is shown on the rota so that overseers can make rota changes accordingly. Without this step, overseers may not otherwise be aware of rota gaps caused by unavailability. Clashes (whether serving date clashes, or unavailability clashes) are shown in red, with unavailability further distinguished by a strikethrough on the serving team member's name. 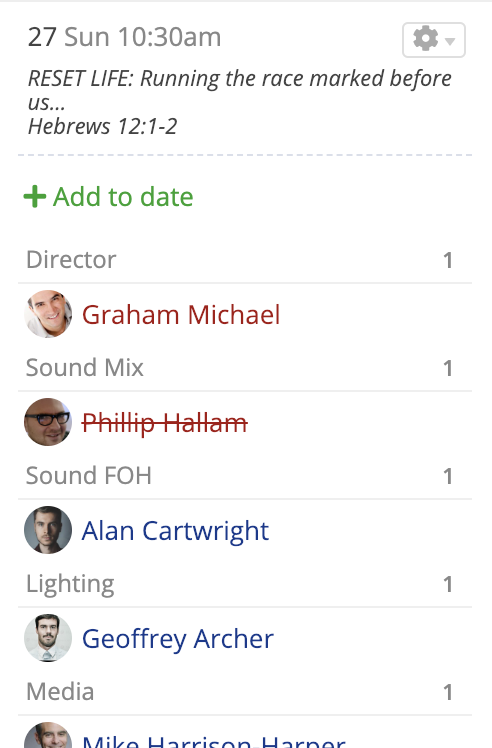 In the example below, Graham Michael has a rota date clash because he is on more than one rota at the same time, but Phillip Hallam is unavailable. Phillip will not receive a rota reminder, but the other rota members would receive a rota reminder with Phillips's name included and shown in red strikethrough to indicate that he is unavailable. 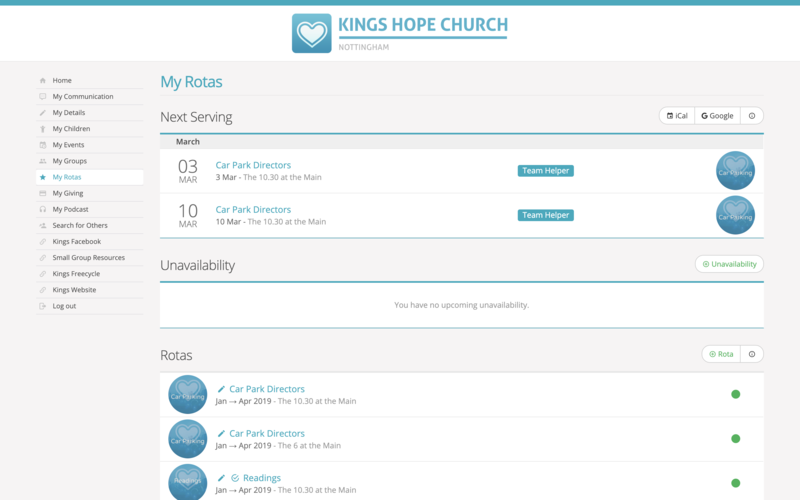 The unavailability feature is accessible by Ministry Overseers via the Unavailability section in the Rotas module in ChurchSuite, and by rota members via the Unavailability section on the My Rotas page in My ChurchSuite. Ministry overseers can also add unavailability on behalf of their rota members in My ChurchSuite. Unavailable rota members will continue to see next serving entries for dates of unavailability, shown in red strikethrough. Unavailable 'next serving' dates will disappear once the rota member is removed from the rota by the ministry overseer, or if the rota member processes a swap with another rota member for an available date. From the Unavailability section within the Rotas module, select Add unavailability. 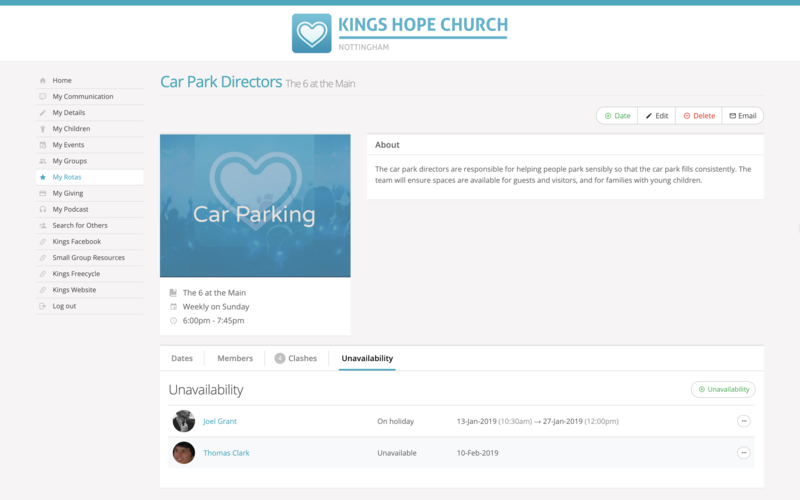 Search for one or more People to add unavailability for - this can be useful if you wish to record the same unavailability for multiple people - perhaps a husband and wife, an entire family, or when all your young people or students head off to a weekend away or a conference. Click Add date and enter an optional Description e.g. Holiday, and then specify the range of Dates. Continue to use Add date to record each range of dates of unavailability. By unselecting All Day you have the option of entering a time to the start and end dates, which may be useful for accounting for someone who might be unavailable for a morning but could be available for an evening service e.g. a pastor who may be preaching at another church. Click Save Changes when you are finished. If any unavailability clashes have arisen as a result of those entries, you are immediately notified. Notifications will be sent to alert the respective ministry overseers. From the Unavailability section you can easily navigate to each rota (just click the rota name in the Clashes column) where an unavailability clash occurs. You can also see a note of who added the Unavailability and when. You can then decide to resolve the issue by removing or swapping the member from each clash date as appropriate. Now, when adding people to rotas, unavailable members are still shown in the list - for both Add to date and Add to role - but they shown in red strikethrough. If you proceed with adding an unavailable person (which you can if you wish), an unavailability clash notification is displayed. Users have the option of automatically adding unavailability when they Add leave in the Calendar module. For Users whose user account is linked to their underlying contact profile in the Address Book, and where there is an active Leave Setup for that user, they'll see an option to auto-add their Unavailability at the point of adding a leave booking, saving them the need to make a second entry for their absence in the Rotas module's Unavailability section. Note that unavailability is block-booked as "All day" covering the full range of working dates in the leave booking sequence, irrespective of the individual days within the range of the sequence. So if a leave sequence is added for Monday to Friday, but the Wednesday is not marked as leave or is not a working day, unavailability will still be block-booked for the full Monday to Friday. If a leave sequence is added for Monday to Friday, but only Tuesdays and Thursdays are working days, unavailability will be added for Tuesday to Thursday. In these instances, if you wish to be more specific and avoid inaccurate block-bookings of unavailability when adding leave, then the user should manually add their unavailability separately from their leave. Care should be taken when automatically adding unavailability where multiple leave bookings are being processed in a single leave entry - adding a single leave entry for the 1st April and another date on 30th September would result in an unavailability block-booking for 1st April through to 30th September! In this example, add each leave booking individually. Line managers with appropriate permissions for the Calendar module can Add leave (with auto-added unavailability) for other users. Unavailability can be auto-added for any leave 'type', not just 'holiday', including any custom leave types created in the Calendar module's settings. Once unavailability has been added when adding leave, subsequent changes to the leave sequence (including deleting the leave sequence) will not affect the original unavailability block booking. The unavailability will need to be edited separately to reflect any changes. When editing a leave sequence there is no option to automatically add unavailability - this option is only shown when a new leave sequence is added. The user profile is not linked to a contact profile in the Address Book. The Unavailability feature has not been enabled (or is disabled) in the Rotas module settings. The user does not have an active Leave Setup profile in the Calendar module. Your church does not have the Rotas module. Overseers can record unavailability for the members of their own rotas within the My Rotas section of My ChurchSuite. Unavailability added in this way will affect all rotas that a team member serves on. To add unavailability, click into the rota member's rota that you oversee, select the rota's Unavailability tab and click the +Unavailability button. In the Add unavailability pop-up window, select the rota Member name from the drop-down list - note you will only see names of people that are members of the ministry. Enter the unavailability Dates and optional Description. Unchecking the All day box will allow you to enter unavailable Times for the start and end dates. Click Add unavailability to save the entry. A success message is displayed, or, if any rota clashes have been caused, these are displayed instead. Click OK to return to the Unavailability list. From here you might now navigate to the rota's Dates page to view your rota. If any unavailability clashes have been advised, these will now be clearly visible on the rota Dates page in red strikethrough. Rota date clashes (i.e. caused by a person serving on more than one rota at the same time) are displayed in red. Hovering your cursor over the name indicates the reason for the unavailability (browser only). There are a couple of other useful ways to record unavailability. The first is from the date menu on the Dates page of a rota - select Add unavailability. A second method is from the rota member menu on the Dates page of a rota - select Add unavailability. The My Rotas section is available to rota members even if they have no published rotas yet. On the My Rotas page, under the Next Serving section is the Unavailability section. This section will list all future unavailability - past unavailability is not visible to serving team members within My ChurchSuite. Click +Unavailability. Just like ministry overseers, rota members can add unavailability for a range of Dates and an optional Description. Unchecking the All day checkbox allows the rota member to specify Times, which apply to the start and end date of their unavailability - ideal if a team member is away for a morning service, but available for an evening service. Rota members do not receive clash notifications when entering their own unavailability. Ministry overseers will see a visual red strikethrough unavailability indicator on their rotas and will be alerted to unavailability clashes when adding members to a rota. Overseers will also receive an email notification if a rota member adds unavailability that gives rise to a rota clash. If the added unavailability doesn't give rise to a rota clash currently, no overseer notification is sent.